Colin Roth offers 'a practical approach to problem solving'. He can help if you have problems with relationships, stress, eating, smoking, concerns about gender and identity, learning difficulties, phobias or sleep. He has a particular interest in the early recognition and management of emotional difficulty and relationship problems to avoid later hardship. Colin's years of experience in teaching and counselling adults and younger people - he trained as an academic counsellor with the Open University in the late 1970s and early 1980s - have led him to specialise in communication skills, which have a significant impact on our lives, far beyond an educational context. Colin Roth calls on a variety of therapeutic skills, but is particularly keen to help you develop your own problem-solving skills and strategies. He will be happy to discuss your personal objectives, help you plan your own strategies and, where appropriate, teach you self-hypnosis. 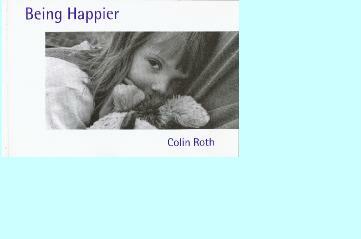 Colin appeared for many years on BBC Radio Sheffield as 'our local psychotherapist' with Rony Robinson. His book, 'Being Happier', was published by Kingfield Press in 1997, and is available through Amazon.co.uk or direct from the author. Colin Roth works at home in central Sheffield. Please phone or e-mail to make an appointment.